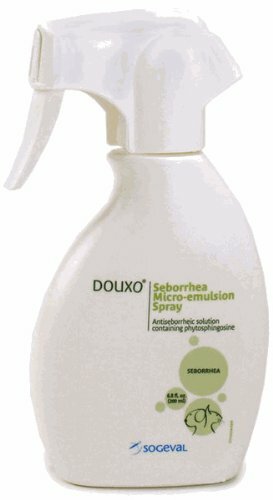 Douxo Seborrhea Micro-emulsion Spray contains phytosphingosine 0.2%, moisturizing and film-forming agents and green tea fragrance. Brush the pet's hair against the natural fur line, then spray the product by holding the pump approx. 12 inches from the pet's body, thus dispensing the emulsion over the targeted area. The product will disperse naturally over the skin; do not over apply.